Photo One: Bob Donahue of Jaffrey, N.H., won the New England Antique Racers Modified feature at Devil’s Bowl Speedway. Photo Two: Bob Seward of Lee, Mass., won the New England Antique Racers Sportsman feature at Devil’s Bowl Speedway. WEST HAVEN – Jason Durgan and Ron Proctor shared the spotlight at Devil’s Bowl Speedway on Friday, June 19, splitting victories in a pair of eventful Modified stock car races. The division ran twin 30-lap features as part of a full card of racing for the NASCAR Whelen All-American Series; other winners on the night included Chris Bergeron, Robert Gordon, Chris LaVair, Bob Seward, and Bob Donahue. Morrisonville, N.Y., native Durgan won the first Modified feature in dominant style, leading all but the opening two laps. He was all by himself up front when a restart with six laps remaining brought Leon Gonyo, Vince Quenneville Jr., and the rest of the field to his bumper, but he blasted away from the pack to cruise to the win. Quenneville, of Brandon, Vt., squeezed by Chazy, N.Y., racer Gonyo for the runner-up spot; Greg Atkins finished fourth with Ron Proctor fifth. Proctor, of Charlton, N.Y., rode the outside lane in a wild, crash-marred nightcap. Whiting, Vt.’s Jimmy Ryan held a big lead over Cody Sargen and Proctor during a long green-flag run; Sargen held second as Proctor committed to the outside for more than 15 laps trying to pass. Proctor finally cleared Sargen at lap 24, just before contact from Durgan’s car sent Sargen hard into the concrete retaining wall at a sharp angle; Sargen was alert and walked with assistance to an ambulance before going to a local hospital for observation. Ryan and Proctor battled at the final restart before Proctor – again on the outside – took the lead from Ryan with two laps left and drove to the win; it was Proctor’s second first victory of the year and his first since the recent passing of his crew chief Ron White. Hometown favorite Billy Lussier of Fair Haven, Vt., ran inside the top five throughout the race and finished a career-best third. Atkins, after a long battle with Lussier, finished fourth for the second time of the night, and Jason Furman had a career-best showing in fifth place. Chris Bergeron of Claremont, N.H., ended a nearly two-year dry spell in the 30-lap Late Model division feature after holding off Todd Stone of Middlebury, Vt., for the win. Former track champion Bergeron was sidelined midway through last season with a knee injury, then missed the 2015 season opener while battling kidney stones. He held off a late charge from Stone for the win. Josh Masterson of Bristol, Vt., finished third with Jamie Aube on his bumper. Lance Allen finished fifth after a long fight with rookie Richard Lowrey III and Chad White. Aube and Allen were each in their first starts of the season. Defending track champion Robert Gordon of Milton, Vt., grabbed his second win of the year out of the hands of Jason McClatchie in the 25-lap Renegade division feature. In spite of overheated brakes, Gordon chased McClatchie down and stole the lead with two laps remaining. McClatchie, of Plattsburgh, N.Y., settled for second place with Jim McKiernan, Scott FitzGerald, and Dylan Rabtoy in tow. Chris LaVair of Saranac Lake, N.Y., took his second-straight win in the Portland Glass Mini Stock division after a 15-lap race. John McCarron and rookie Brad Bertrand had an entertaining battle for second, which went McCarron’s way. Andrew FitzGerald and Tanner Crary were next in line. The New England Antique Racers club made its annual visit to Devil’s Bowl Speedway with a nice field of retro racing machines. 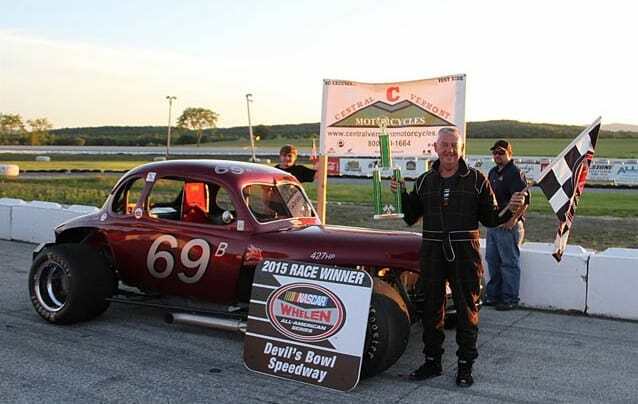 Bob Seward of Lee, Mass., drove his 1937 Plymouth coupe to a win in the 12-lap Sportsman race over Barry Roy and Allen Davis, while Bob Donahue of Jaffrey, N.H., drove his Pinto-bodied 1982 Troyer chassis to the 12-lap Modified win over Scott Poirier and Richard Trempe. Devil’s Bowl Speedway is back in action on Friday, June 26 at 7:30 p.m. with the annual “Hometown Heroes” Night; all first responders, corrections officers, military, and veterans will be admitted free. The Red Knights Motorcycle Club will visit with a pre-race parade, and all four racing divisions will be in action. Regular admission is $12 for adults, $10 for seniors, and free for children age 12 and under. Devil’s Bowl Speedway is located on Route 22A in West Haven, Vt. For more information, visit www.DevilsBowlSpeedwayVT.com.